Chocolate and Peanut Butter are a match made in heaven. 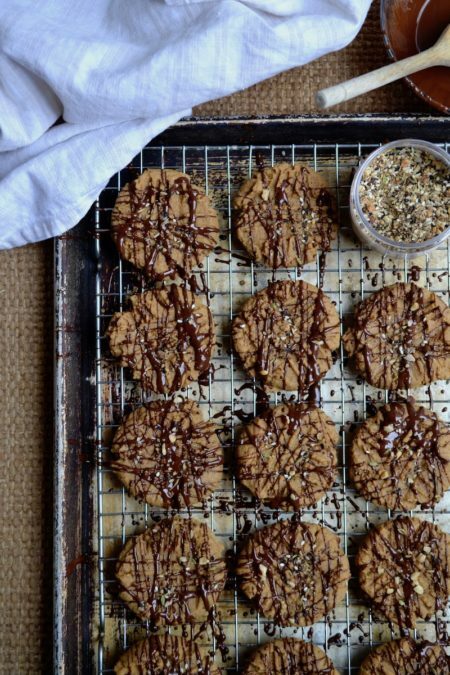 These Peanut Butter and Chocolate Drizzle Cookies topped with a little sprinkle of our Glory Kitchen Cairo nut & spice mix are delicious tasting cookies with a surprise note of unique flavors. The finishing touch of crunchy sesame seeds, pepper, fennel, and almonds from the nut blend takes the ordinary cookie to an elevated and sophisticated level. This is a peanut butter cookie recipe to keep front and center in your recipe archives. Although I’m not the biggest fan of peanut butter alone, I think my favorite type of cookie might be a peanut butter one paired with a touch of chocolate. They’re not overly sweet and they have a bit of a chewy, soft center from the nut butter which makes them just irresistible. The drizzle on top adds a bit of flare and of course that chocolatey touch makes a cookie a bit more decadent. I used dark chocolate, however, they would be equally delicious if you like a sweeter version such as semi-sweet or even milk chocolate. And one more thing, I loved these so much I made them a second time and doubled the recipe batch so I could freeze the dough and have some slice-and-bake cookies at anytime our sweet tooth acted up. Just take the dough and place it into parchment paper. Then roll it into a log (just like the shape of slice-and-bake cookies in the grocery store), wrap tightly in plastic wrap and freeze. When you’re ready to bake, defrost just a bit and slice your cookies for a quick and easy fresh baked cookie. ½ pound (2 sticks) butter, room temp. Heat oven to 350° and set the rack in the center of the oven. Sift together flour, salt, baking soda & powder and set aside. Beat the butter until it is creamy. Add the sugar and beat together until it is creamy. I used 1 cup organic sugar and 1 cup coconut palm sugar. Add the peanut butter and continue to beat to combine. Add in eggs, one at a time, followed by the vanilla. Turn the beater on low and add in the flour mixture which was set aside earlier. Using tray with a silpat liner (a washable liner used for easy removal in baking), or a parchment lined baking sheet, scoop out dough a bit smaller than the size of a golf ball - I like to use a very small ice cream scoop to achieve a consistent size for the entire batch. Place them about two inches apart on the baking sheet. After they are all scooped, using a fork, dip the fork into a glass of cold water and then using the back side, press the dough to make the tongs imprint. Then turn the fork and repeat the imprint so it makes a crisscross on the surface of each cookie. Bake at 350° until the cookies are ever-so-slightly browned, about 15-18 minutes. Each oven temperature is a bit different, so keep an eye out and make certain they do not over cook. Remove from the oven and allow to cool completely. After about 4 minutes out of the oven, I like to transfer them to a wire rack to crisp and cool completely... this allows air to completely circulate around the cookie. While the cookies are cooling, place the chocolate chips into a small glass mixing bowl and place into the microwave set for 30 seconds. Remove the chocolate and stir well with a wooden spoon. If they do not melt completely while stirring, place back into the microwave and heat for another 15-20 seconds. Repeat this until the chocolate is completely melted (you do not want to overheat the chocolate, just melt enough it so it becomes softened and can be drizzled) Taking a small spoonful and using a quick sweeping motion, drizzle the chocolate over the cookies (placed tightly side by side on the cooling rack or baking sheet) Criss Cross the motion and drizzle in the opposite direction as well. Now sprinkle the tops with a pinch ful of Cairo nut & spice mix. Allow the chocolate to harden and cool completely. Enjoy! I used dark chocolate for the drizzle, however, if you prefer semi-sweet or even milk chocolate these would be delicious as well. This recipe is adapted from the NYTimes.